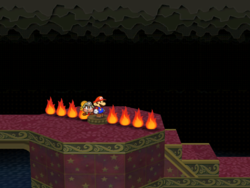 The Palace of Shadow is the final area that Mario and his comrades visit in Paper Mario: The Thousand-Year Door, and is where the Shadow Queen resides. It is accessed by going through The Thousand-Year Door. The Palace is one quarter of the old city that was ruined 1000 years ago. Over the years during which the Queen reigned, the Palace became rich with stolen treasure, which became legendary over the centuries since her defeat. In this palace, the Shadow Queen possesses Princess Peach, who Sir Grodus had delivered to her. Mario and company drudged through the palace and its inhabitants, including the middle sibling in the "tail" family, Gloomtail. Mario and his allies later fought with the Shadow Sirens, who now consisted of Beldam, Marilyn and Doopliss. 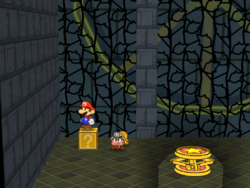 Soon after, Mario's party finally made it to the Shadow Queen's inner sanctum, where Sir Grodus was. Mario and his party defeated him, and also defeated Bowser and Kammy Koopa, who literally "dropped in" on them unexpectedly. Sir Grodus retreats to the final room to use Princess Peach as an offering to the Shadow Queen. The first room is rich and very detailed with roses and patterns. Past this is a bridge across an expanse of water, the cave "ceiling" can be seen here. The room afterwards is a large staircase that goes even farther underground. Later, a garden area shows off some streams and the Riddle Tower. After the tower's riddles are all completed, some ancient machinery will activate, causing the long hallway leading to Gloomtail to collapse, revealing a lower area filled with enemies. 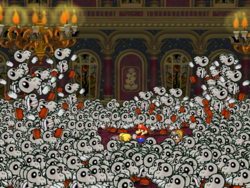 One of the last rooms is a huge chamber with odd pillars, and then, the throne room where Grodus uses Princess Peach. A secret door leads to a huge staircase down to the crypt containing the Shadow Queen. The in-game map description reads, "The palace found behind the Thousand-Year Door in the ruins beneath Rogueport." For enemy formations in the Palace of Shadow, see here. All or Nothing In the fourth room from the start, it's in the red question block. Boo's Sheet In the fifth room from the start, it's in an invisible block on top of the center of the rotating filebars. Jammin' Jelly In the eighth room from the start, it's in the right of the question blocks in the north. To the right of Gloomtail's room, it's in the second question block. Requires Admiral Bobbery. Accessible before activating the solar system in the Ridder Tower. In the hallway after the Sir Grodus fight, it's in the chest near the end. Life Shroom In the room across descended hallways 1 and 2, it's near the east entrance in the north part. In the room across descended hallways 2 and 3, it's in the yellow question block above the spinning wheels. In the fourth descended hallway, it's on a high petestal. Accessible with the airplane panel. Palace Key In the sixth room from the start, it's dropped by the Dark Bones. In the room across descended hallways 2 and 3, it's on a ledge to the lower-right of the spinning wheels. In the room across descended hallways 3 and 4, it's in a chest in the east part. Palace Key In the first-floor Riddle Tower, it's in a chest in the southwest room. Accessible by hitting the ! Blocks in this order: left, left, left, right, right. In the first-floor Riddle Tower, it's in a chest in the northwest room. Accessible by hitting the ! Block after clearing the blocks. In the first-floor Riddle Tower, it's in a chest in the northeast room. Accessible by hitting the ! Block beyond the fake wall on the right. In the first-floor Riddle Tower, it's in a chest in the southeast room, covered by a piece of paper which can be blown away by Flurrie. In the second-floor Riddle Tower, it's in a chest in the southwest room. Accessible by hitting the ! Block after defeating the bones in the order from weak to strong. In the second-floor Riddle Tower, it's in a chest in the northwest room. Accessible by hitting the ! Block after clearing the blocks. In the second-floor Riddle Tower, it's in a chest in the northeast room, beyond the wall on the right which can be blown up by Bobbery. In the second-floor Riddle Tower, it's in a chest in the southeast room. Accessible by hitting the invisible ! Block. Point Swap In the room across hallways 3 and 4, it's in an invisible block above the yellow question block on the ground in the west part. P-Up, D-Down P In the eighth room from the start, it's in the red question block in the north. Repel Cape In the room across descended hallways 1 and 2, it's in a yellow question block. Shooting Star In the third room from the start, it's in the question block near the entrance. In the room across descended hallways 2 and 3, it's in the chest in the southwest corner. In the fourth descended hallway, it's on a low petestal. Accessible with the airplane panel. Star Key In the Gloomtail room, it's in the chest box spit after Gloomtail is defeated. Stop Watch In the second room from the start, it's to the north of the entrance. Thunder Rage In the first descended hallway, it's in the high question block. Ultra Shroom In the seventh room from the start, it's in the question block near the entrance. To the right of Gloomtail's room, it's in the second question block. Requires Admiral Bobbery. Accessible before activating the solar system in the Riddle Tower. In the hallway after the Sir Grodus fight, it's in the chest near the start. Boo's Sheet In the area with a bridge over water with Fire Bars, in a middle of the room is a couple of Fire Bars spinning around one spot. 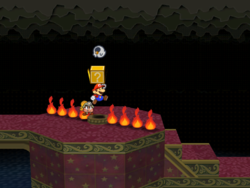 At that spot, Mario should jump from it to reveal the hidden ? Block. Point Swap In the mechanical side of the hallways leading to the palace's throne room, one of the rooms has a lone Coin Block. Jumping above this block will reveal the hidden ? Block. There's a long stairway connected to this underground lake. Those lights floating in the darkness are really pretty... but also pretty spooky. We're inside the Palace of Shadow. There's a long corridor leading down. This palace sure is big and super-rich-looking, huh? I wonder what kind of people lived here before the place slept for 1,000 years? We're inside the Palace of Shadow. This is a corridor, I think... Looks like spike traps... Forget the enemies... Just take it one step at a time! We're inside the Palace of Shadow. There's a large bridge over the lake here. Those fire bars in the middle are kind of a problem, huh? We'd better avoid them. If you're all sketched out trying to jump them, just use Vivian's Veil ability! What a humongous room... I'd say it was pretty, but even this place feels weird... It's like the whole palace got cursed or something. Did you just say "duh" to me? We're inside the Palace of Shadow. There's a long hall leading down from here. It kinda feels like the earth is slowly swallowing us as we progress down. Yuck. We're inside the Palace of Shadow. This seems to be a corridor. I'm observant, huh? Listen, Mario... I know I've said this before, but don't forget that you're not in this alone. You should rely on your partners' abilities if you ever get stuck or anything. This is another corridor. I wonder how long these things go on? I'm sure we'll need all of your special skills, AND those of your partners. Don't forget to use your strongest muscle, too... Your noggin! Hee hee! We're inside of the Palace of Shadow. This is another corridor. Big surprise. We'd better watch below our feet as well as above our heads, know what I mean? But, uh, don't forget the area above your head, too! Does that make any sense? We're inside the Palace of Shadow. There don't seem to be any big puzzles here. We just need to go open that door on the right. That's all. Whee. Exciting. This is Gloomtail's room. I wonder if he was here for all 1,000 years? Dragons do live a long time, I heard, but dang... Without him in it, there doesn't seem to be anything special about the room. There's something written on the wall. Based on that message, I'd say... That word "beyond" probably refers to away from the door. So that means the left block. So then the word "before" must refer to the right block. Are you with me, Mario? Still, the way they repeat those words must have some meaning too, don'tcha think? There's something written on the wall. Based on that message, I'd say... Maybe if we break a block here, it'll do something to a block in another room? There's something written on the wall. Based on that message, I'd say... ...There's definitely something in the center of the room, don'tcha think? But what are we supposed to do with something we can't see? This is insanity! There's something written on the wall. Based on that message, I'd say... We're supposed to defeat these guys in order, from weakest to strongest? Uh... Well, I know the weakest is the Dull Bones in the green shoes there... That help? There's something written on the wall. Based on that message, I'd say... I guess we just have to go straight in from the entrance. And then when we get to the wall, we have to do something... Yeah... something. There's something written on the wall. Based on that message, I'd say... That if we can be seen, then there won't be anything to see in this room? ...Huh? The gears in the back of this room started moving when we unlocked that planetarium... Listen, Mario... We're gonna have to rely on everything we've learned to get through this. Just think about what we've been through, and I'm sure you'll find a way, OK? We're inside the Palace of Shadow. This place is all about kooky puzzles, huh? You see those marks in the middle of the corridor? They've GOTTA be important. We're inside the Palace of Shadow. We must be WAY underground by now. I'm totally running out of advice at this point, sorry. I have advisor's block. Hey, but don't worry! Have faith in yourself and your friends, and we'll win! What is this weird room? It's quiet... A little TOO... Well, let's just say it's quiet. There's a Save Block over there, and I'm thinking it would be smart to use it. This must be the main hall or something. It sure is a humongous space... This must've been where the most important person in the palace stayed... But standing here makes me totally uneasy... Why is that? There's a long, long staircase leading down. And I get a REALLY nasty feeling about what's waiting down there. But we've come this far, so we gotta soldier on. Let's go, Mario. We're in the deepest room in the Palace of Shadow. ...The Shadow Queen's crypt. I gotta be honest... I totally thought we were goners at the time. Seriously. I was secretly wigging out, but then I saw how you wouldn't give up... Awesome. Anyway, enough reminiscing. There's nothing here now, Mario. Let's go back. Yami no Kyūden Palace of Darkness (from yami 「闇」, meaning "darkness" and kyūden 「宮殿」, "palace"). 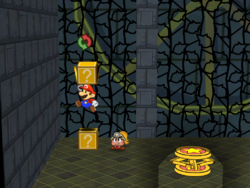 The main track of the palace is a cover of the Underground theme from Super Mario Bros. with some added dark, eerie sound effects. This music also briefly quotes the Castle theme from Super Mario World. The music for the second half of the palace is an even darker cover version of these classic melodies. The Palace of Shadow is the only place in the entire game without a single Shine Sprite or Star Piece. If the player has Vivian at their side when they enter the palace's throne room, she notes that it seems vaguely familiar to her. This page was last edited on October 15, 2018, at 21:21.